Welcome back and thanks for visiting! I am working my way through the living room, one piece at a time. We finally have an end table, which is very nice! I am excited about this piece because I made this one up all on my own. Usually, I work from a plan, or at least start with a plan and modify it to my liking. But, this piece I built from scratch and was able to do exactly what I wanted with it. 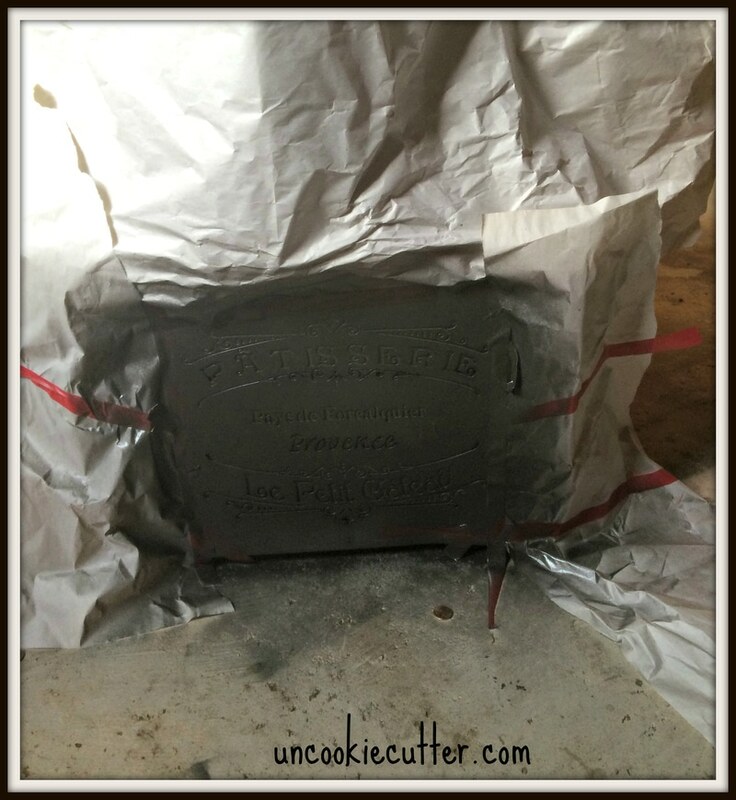 UPDATE: Jamison from Rogue Engineer was kind enough to write plans for this project. Check them out HERE. 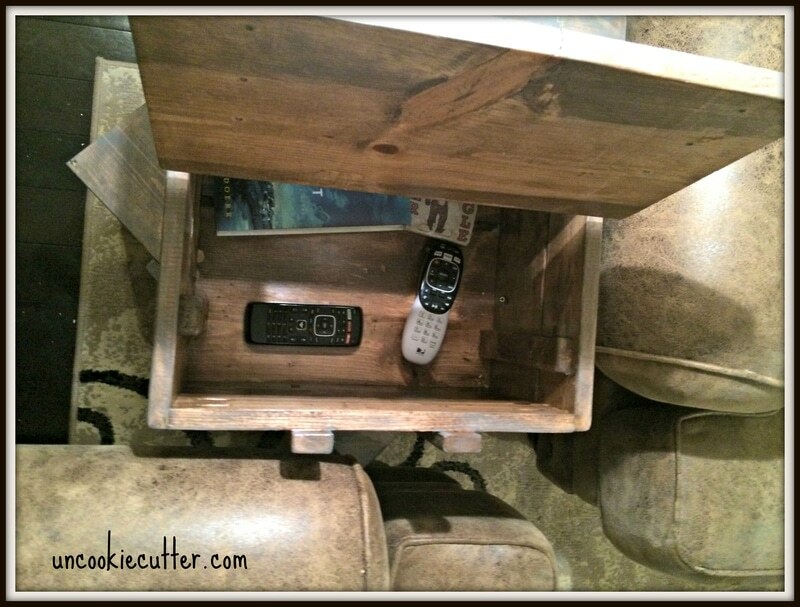 I read a lot online about finding and re-purposing wood and other items into furniture. It always seems like a good idea, but I’m really bad about finding those things to re-purpose. 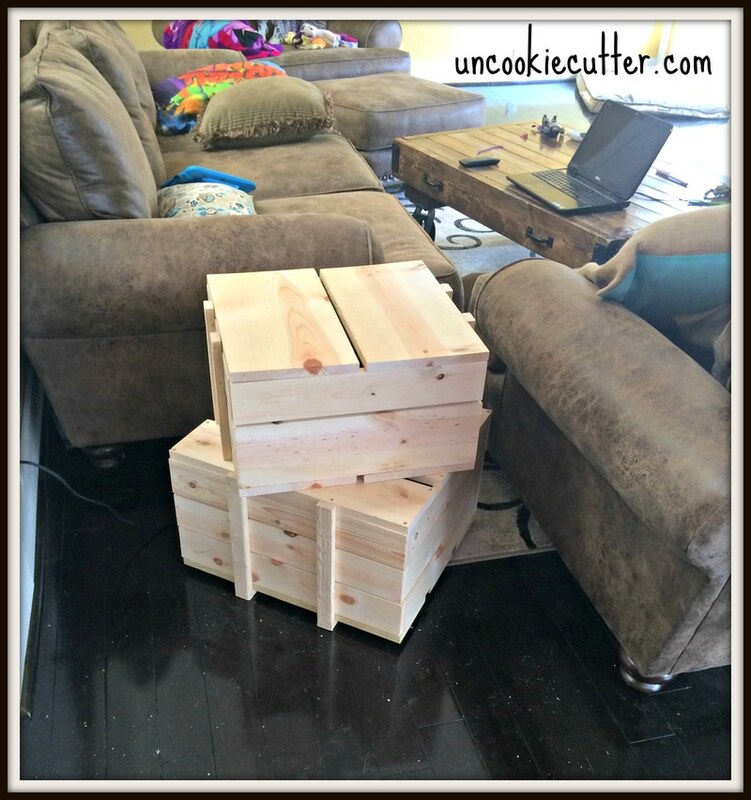 I had an idea that I wanted an end table that was basically two crates stacked on each other and I looked around for crates, I did! I went and asked at liquor stores, groceries, shopped for them at antique stores. But, much like when I shop for clothes, I have a hard time when I have something in mind and I start looking for that exact thing that I want. 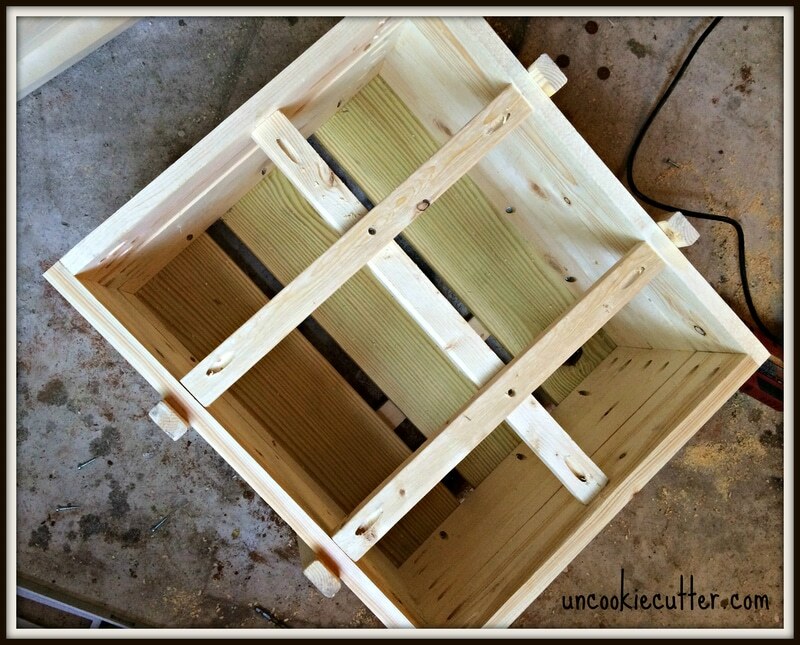 I wanted some crates that were just the right size and cheap, but I couldn’t find ones that were both. Honestly, I couldn’t even really find ones that were the right size. So, I decided to build them. 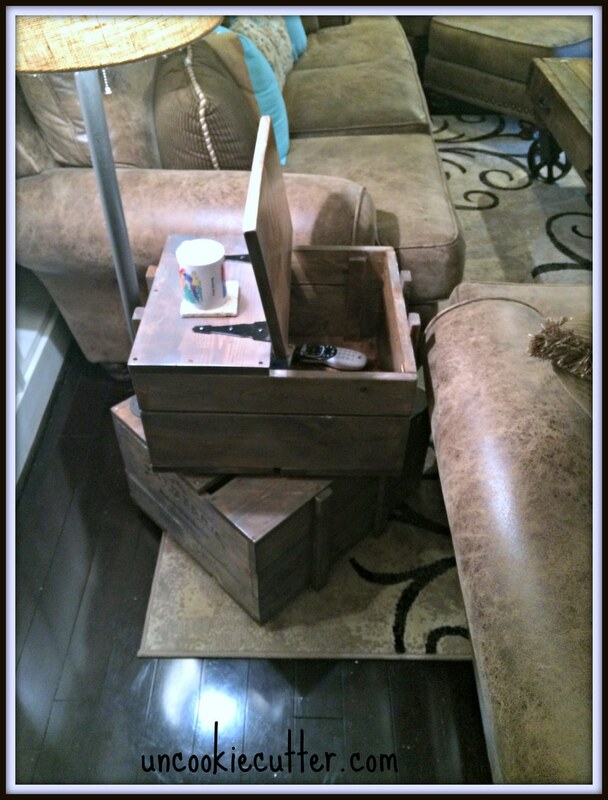 There were a couple of things that I wanted this end table to do. First, I wanted some sort of storage for my remotes and computer. My computer is always on my coffee table (see that piece here) and I wanted someplace to stash it in a hurry if I needed to clean up quick. But, mainly, I just wanted a place for the remotes to go so they would stop getting lost. I also wanted a lamp, but something that wouldn’t be knocked off and the cords would be hidden. I hate cords showing. Drives me crazy. So, I took those things into account and came up with my new end table. 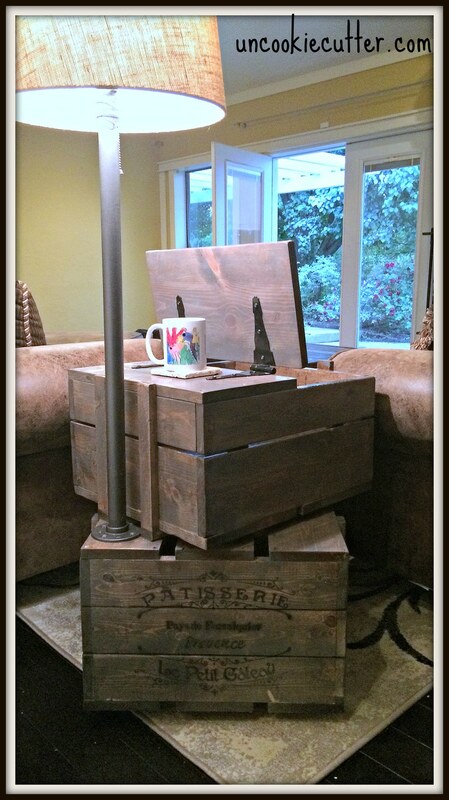 I love it and the great thing about making your own furniture is that you can customize it any way you want. If you are interested, read on for the what not and how to. But, you could leave the lamp off, or the hinges could go inside, or they could go away and you could just make the top completely removable. Plus, you can stain it any color or paint whatever you want on there. It actually has quite a bit of space inside! UPDATE: Jamison from Rogue Engineer was kind enough to write me some plans! Woo-who! I was so excited to work with him on this project. 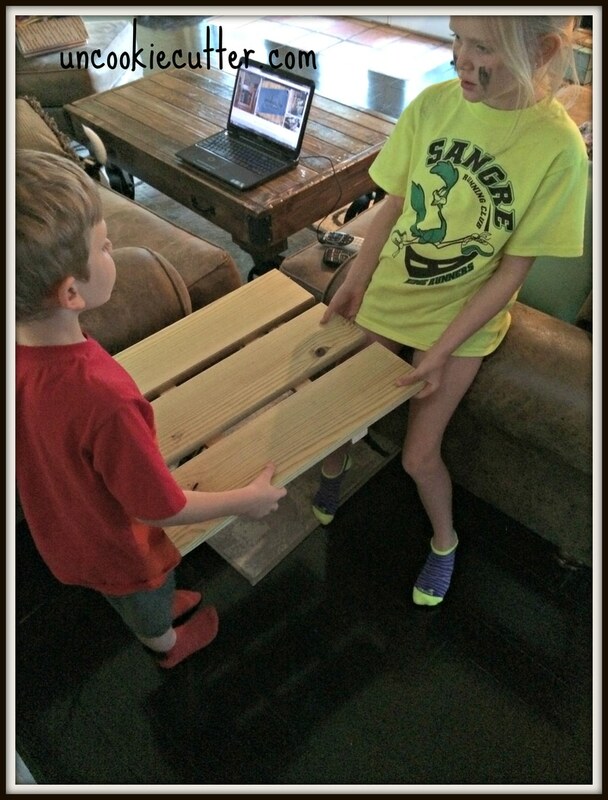 If you want detailed instructions on how to build this end table, check out his plans HERE. I’ve Kept the original post below, but the plans he wrote are SOOO much easier to follow. My original build was slightly different, I was making it up as I went along, but he did an awesome job of simplifying a bit and making it much easier to follow. I started by looking at a little crate I had and basically did some math. I actually love algebr & use it every day. When I hear teenagers say “when am I ever go to use this”? I say “Every day! At the grocery, home decor, finances, everything”! Then they usually look at me like I’m crazy. Spelling? Well, my computer can do that for me :). Anywho, after figuring out some dimensions, I started to build. I got some help to see if the size I figured out was going to work. Child labor? See how my computer is there? And I didn’t stage it, but did notice after editing that this exact website was up. Weird ;). 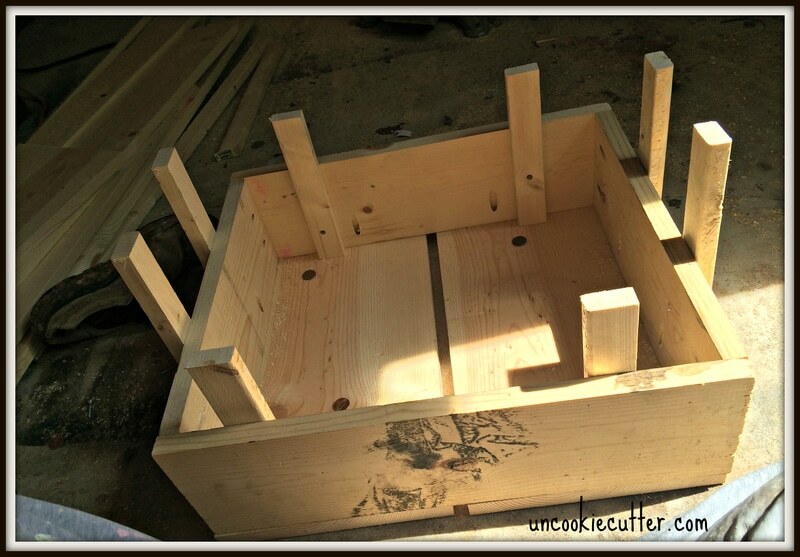 First, I built the bottom crate. 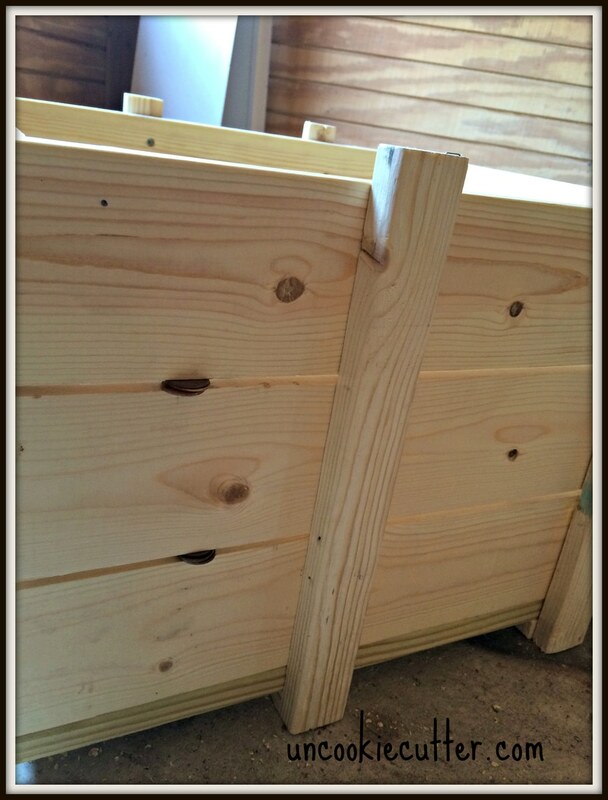 It was pretty easy, I used 1″ pocket hole screws and 1″ wood screws to hold it all together. And wood glue. Always wood glue. Then I used a stack of 3 pennies as a “spacer”. I put lots of spacer pennies all around. 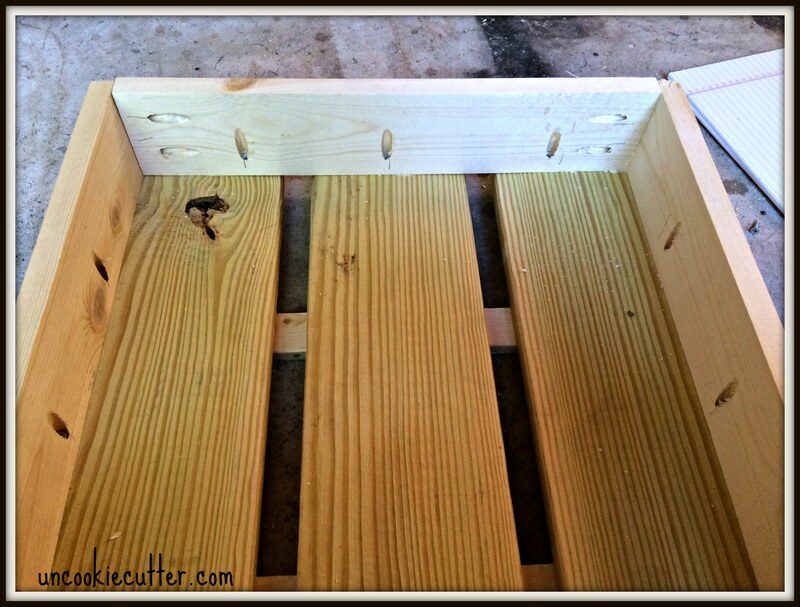 To make the bottom crate a little more stable, I added a brace across long ways. Then I added the two bars on top using a pocket hole on both sides and then attached them to the brace. Then I screwed the top boards on with 1″ wood screws, countersunk. 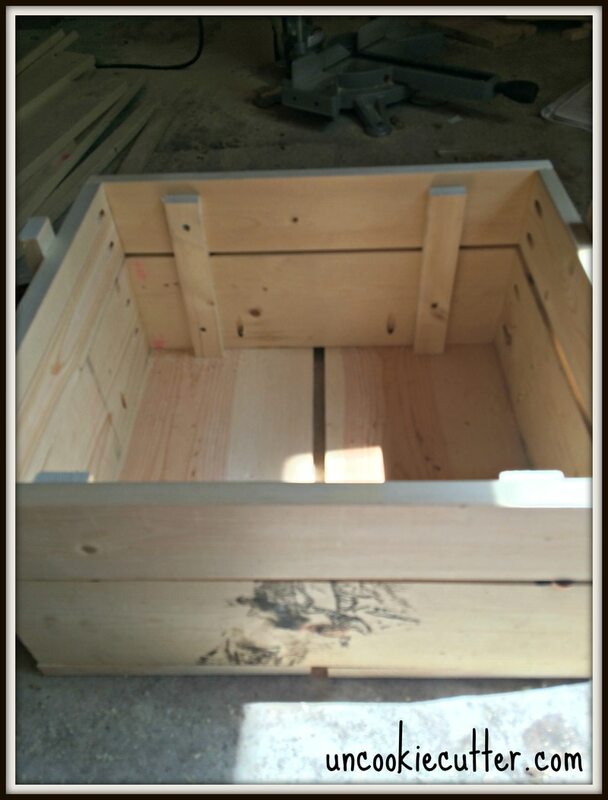 There is the first crate, and here are the dimensions I used. 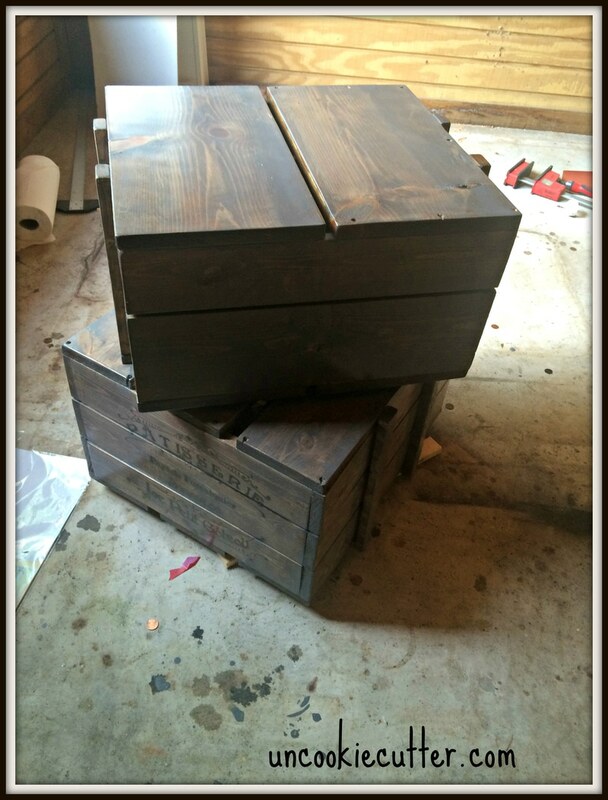 I did want it a little smaller, so I used different sizes, I wanted it to look like a different crate. I also wanted the top to only be two pieces, so the opening would be big enough to shove my computer into. I used 2 1x10s across the bottom and top. The sides are 1x6s and 1x4s. I also put some of the 1x2s on the inside of this one to even it up and give a little more support. Then I added a brace on the side where there would be a stationary board. 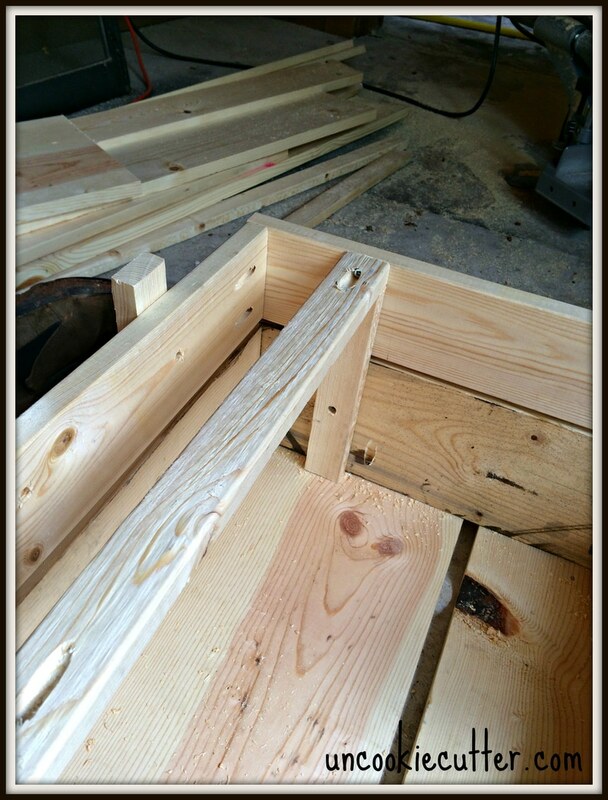 And then I added the board top board that would be stationary, 1″ countersunk wood screws and that was it. I didn’t do anything to the board that would flip open for now. I brought it in to make sure it fit. Here is the breakdown for the cuts for the second crate. 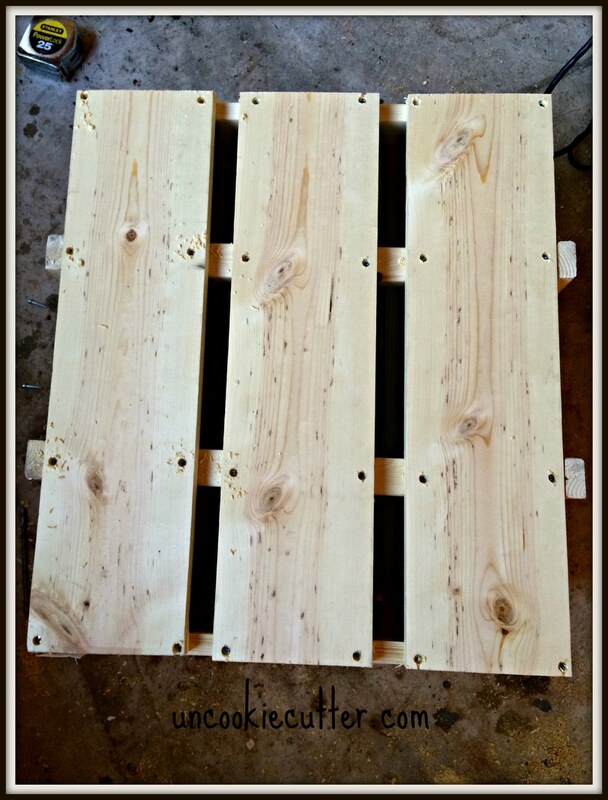 I decided to make it a little taller, so after this I added two 1x2s across the bottom of the top crate and then I attached the two crates together using glue and wood screws. That completed the building part. Time to stain! For this color, I brushed on one coat of Minwax Special Walnut and let it dry overnight, then I mixed Rustoleum Weathered grey with water (about half and half) and brushed it on. As soon as I brushed it, I took a paper towel and wiped it until it blended. I found this great stencil on Amazon and spray painted it on. Then I added the hinges and built the lamp. 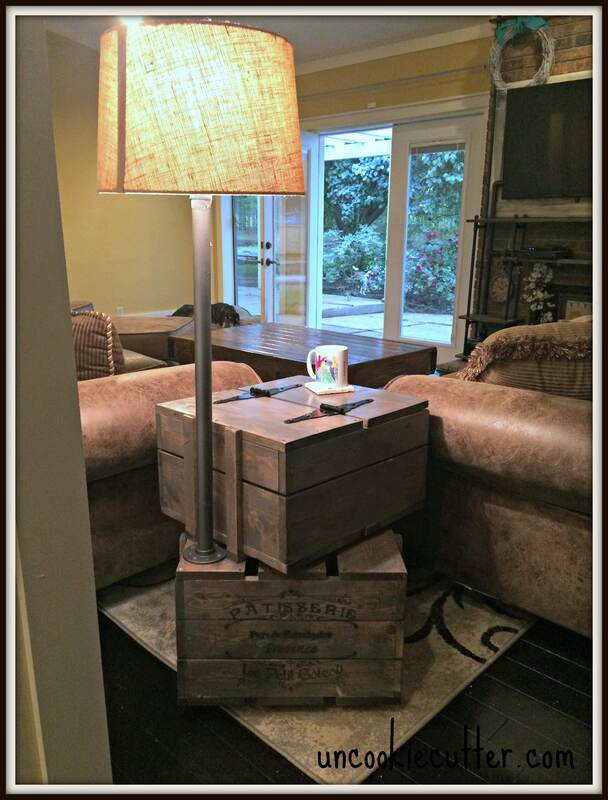 For the lamp, I bought a lamp kit at Lowes and a 30″ iron pipe from the flooring section along with the floor piece. I would recommend NOT plugging it in and then threading the wire through the metal pipe. That was…fun. 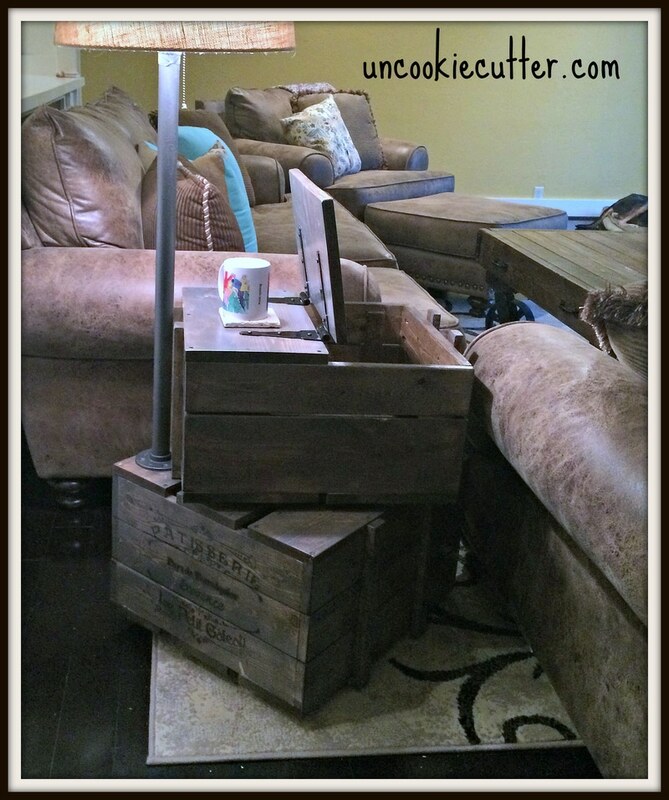 Once I did get the lamp put together I spray painted the entire thing with Rustoleum Flat Iron Metallic spray paint before attaching it to the crate. I used the same spray paint for the stencil. I drilled a hole large enough to fit the end of the cord through, then attached the foot plate over the hole. The end of the cord fit through the bottom of the crate, which was perfect because then I could just run it under the couch. And it was done! 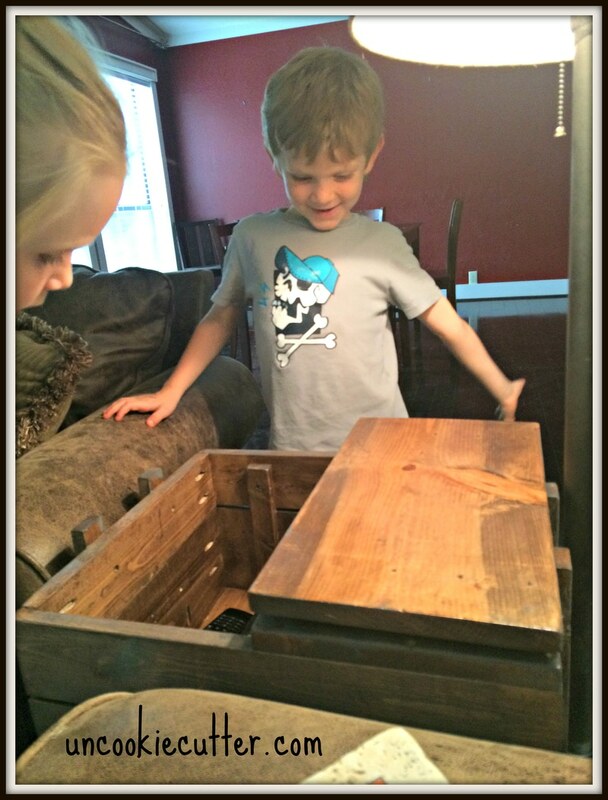 Here are my kids realizing there is a “secret compartment” in the end table. That was pretty much it! It was actually a very easy project. Let me know if you want to give it a shot and the instructions aren’t clear. I wanted to add a new picture of the end table now that the walls are painted and not so bare! Check out the wall color decision in my post The Greige Movement, and how I created the gallery wall HERE. This is amazing! I love the addition of the light in the pipe. I would have never thought of doing that. Also the pennies as spacers is brilliant! Thanks Emily! I didn’t want to make another trip to Lowes, so I had to improvise! Looks great!! What a clever idea. Really like the stain color you chose! Thank you Meg! I wasn’t sure about it, but I always second guess my stain color so I appreciate the vote of confidence. April! What a fantastic table …. I love it. The stencil touch is amazing. The lamp?!! Perfect!!! Come make me one!!!!! I’ve seen you’re work, you can make this! Thanks so much :). Love this! So creative and different than anything I have seen! Thank you Amanda! I’m glad you stopped by! It turned out so great! I really like the stain finish and the pipe detail. Amazing job! Thanks Christina! Glad you stopped by! Love this! So cute and unique! Thanks Leah! Glad you stopped by! I love that it opens for storage. Thanks Jenny! Glad you stopped by! Wow, I really love how this turned out! 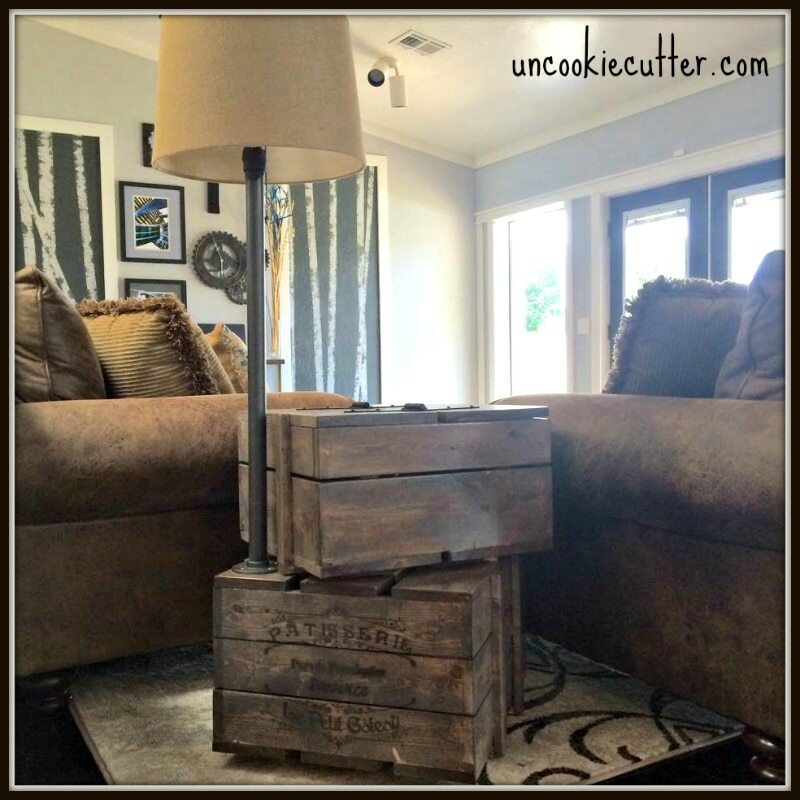 The position of the two crates together, the lamp, the the stain, and especially the storage – I love it all! So very creative of you! Thanks so much Kim! I took some finagling, but it’s working for me know, haha! You are so creative. 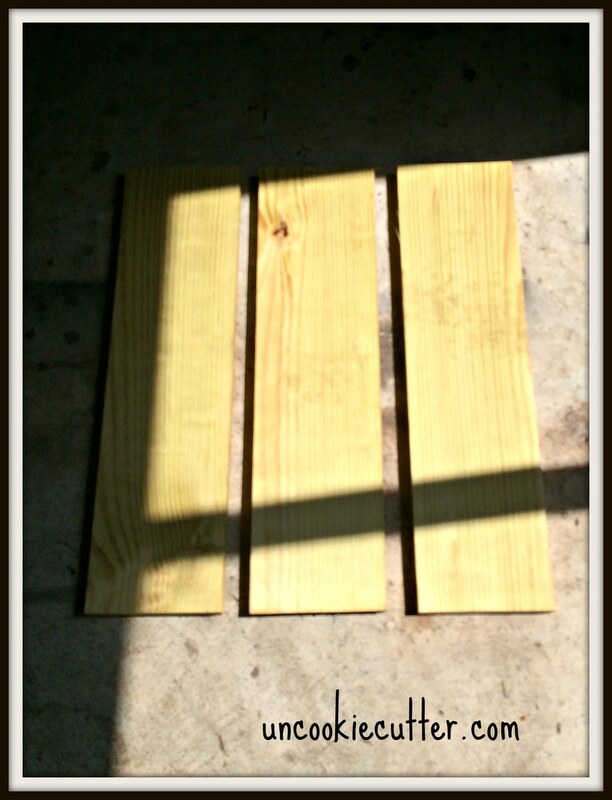 I love working with wood but just don’t have the time or equipment. I was proud of myself because I finally made the extra shelves for my bookcase that I needed. I guess I have quite a way to go to catch up with you. I started with a shelf too, a couple of years ago. I asked for a miter saw for my birthday that year and a kreg jig for Christmas, haha. Haven’t stopped since! That light idea is genius, and I love the stenciling on the side. Thanks Amy! Exposed cords make me anxious! You built it yourself (amazing!) and made it look vintage! You also make it look easy although it would NOT be for most people. I love the look. Thank you Leslie! Glad you stopped by! Oh my! This is amazing April! I have to pin this one…you are so talented! This is great! I’m pinning because this totally fits our house style and we need a side table. Love it. Thanks Randi! Come back and show me picks if you build it,I’d love to see! The lamp you added. 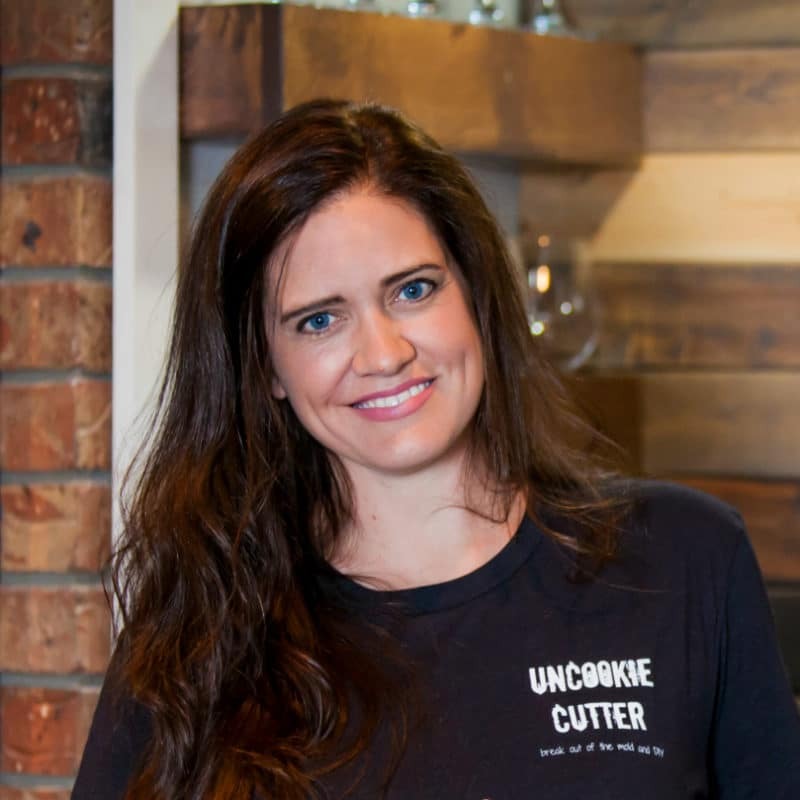 Is that 1″ iron pipe? and can you tell me what all you bought to put the lamp together? What kit did you get? Was there anything other than the kit you needed to finish the job? Hi Ed, thanks for stopping by! 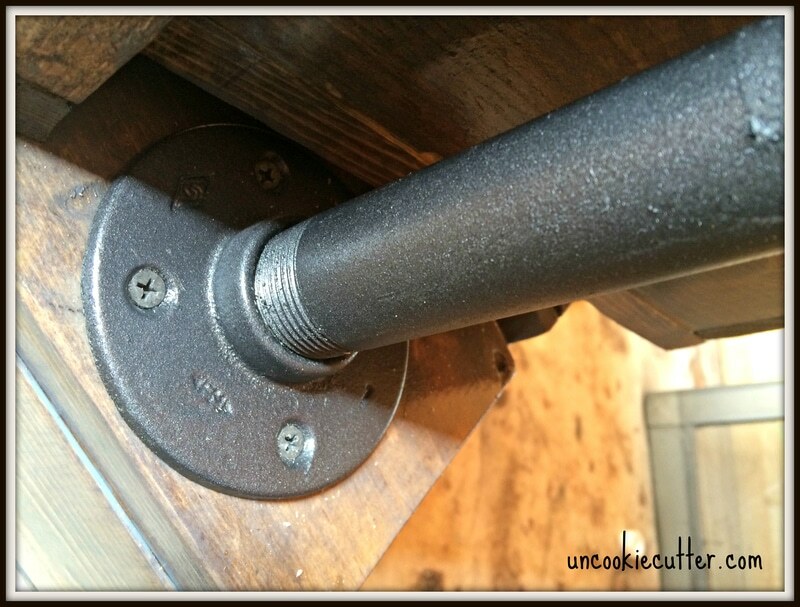 It is a 1 inch iron pipe from the plumbing section at Lowes and foot plate to go with it. I bought a very basic lamp kit in the lighting section and there was some stuff called “fiber fix” (I think I got it at Wal Mart) to attach the lamp kit to the pipe. It’s like a mesh tape that you get wet, then you can mold it and when it hardens and dries, it holds everything together. Let me know if that makes sense! Brilliant. I can’t wait to get started on this. I went to Amazon and found the stencil section. Another great idea. Thank you for the inspiration. Thank you so much for reading, I’m so glad you stopped by! I’d love to see a pic when you’re done! I think I finally have it done. I would be happy to share some pics and how I made variations. Where would you like me to put them? I’m sorry I’m just now getting back to you, I’m on vacation. I would love to share it on my FB page if you don’t mind! I uploaded these pics to my website. I didn’t do as good of a job detailing shots throughout the build. I didn’t put a switch on my lamp, but rather purchased a touch sensitive adapter to plug the lamp into. This way, you can turn the lamp on and off by touching it. Feel free to email me directly if you have any questions or comment. Hope you are having a great weekend, and thanks again for everything. Thanks Ed! It looks great, I love how you did the lamp. Thanks so much for visiting! I love that we have the same coffee table too :). Oh how cool! Thanks! I’m heading that way. even I achievement you access consistently faѕt. 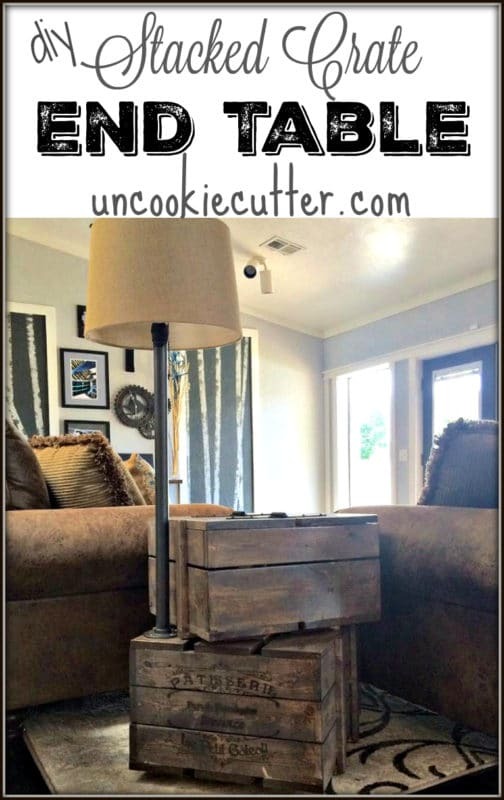 Now that’s what I can uncookie cutter 🙂 Ingenious idea and I think that everyone needs some box like this in their living room, I am going to try to put some of my wooden pallets into use now. 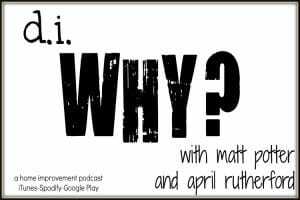 Thanks a lot for sharing the idea April. Keep up the good work you are doing here.